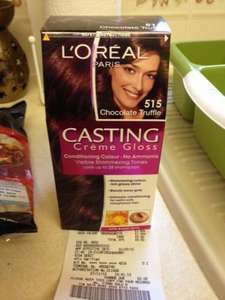 The L'oreal hair dye, chocolate truffle 515 is £1 in Asda. Not sure if this is local or national. £1 on the shelf ticket price. Great bargain - usually £6. Also while I was there I picked up some of the frozen bolognase beef mince and it was 50p (deal posted earlier today). My favourite colour. (_;) Just no asda nearby. Heat added. Best price I've seen it. Is a great colour and lasts quite sometime. Lots of them in Asda Dunbar @ £1 too. I've just been to the Asda in Northampton and there's a load of these on the shelf again for £1. Deal posting newbie! This is la_mo first deal post. Help out by leaving a posting tip or just to show your appreciation for their contribution.